A useful time control tool for NCD ProXR relay boards. Support 16 relay channels with control panel separately. Quick Timer is a useful time control tool for NCD ProXR relay boards. Quick time setting makes it easy to use for science project, laboratory experimenter and home automation and so on. It supports one relay board with 16 relay channels. Each channel has a control panel separately. Relays can be turned on/off manually and automatically. Time can be set with counting down or up. It supports rapid buttons for control all relays directly. Friendly interface makes it easier to use. 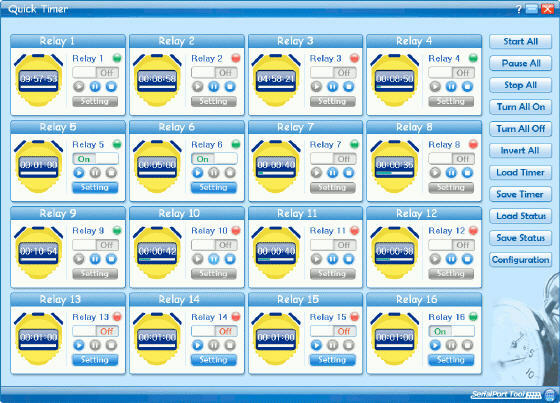 Support 16 relay channels with control panel separately. Support time setting with counting down and up. Support turning on/off each relay manually and automatically. Supports turning on/off or inverting all relays directly. Display current status of all relays. Display left or passed time of each relay. Status of relays can be saved for later loading. Beautiful GUI, easy to setup and use. Quick Timer is a useful time control tool for NCD ProXR relay boards. Support 16 relay channels with control panel separately. Relay Timer PPC - a useful tool for NCD ProXR relay controller boards with Pocket PC. PTZ Controller PPC - An application for Pocket PC to control PTZ camera. It runs on PPC2003SE or WM5.0. Comm Operator PPC - A powerful RS232 device emulator on Pocket PC. It works with Wifi, Ethernet and Bluetooth besides normal serial port. Recipe Minder - a recipe organizer and planner which can hold thousands of recipes and sort them in menus and categories, even by days. Plan your meals using its calendar function. Ultrawave Guitar Tuner - an accurate software guitar tuner, that works in a similar way to a digital pocket tuner that you would find in a music shop. Herbal medicine - enhance immune system functioning, improve endurance and memory, overcome fatigue, stress, nervous anxiety and mental confusion, and so on. Qigong for Self-Health Care - Chinese magic Qigong with 5000 years history – Key book of exercise for body and mind.